North Village Community Club is hailing the efforts of CedarBridge Academy who plan to take a class of 12 students to participate in a Special Olympics track meet which is being held at the University of Delaware in Delaware, with NVCC making a $500 donation towards the travel costs. The relationship between North Village and CedarBridge Academy’s Functional Skills class began two years ago as part of the class’s hands-on daily living skills practice. Every week the students launder the North Village Masters and Corona team’s kit. “When we found out that CedarBridge was looking for dirty laundry we were more than happy to oblige”, joked Stephen Coddington, North Village Community Club President. “The students do a great job which is most sincerely appreciated by North Village Community Club. We hope more people will assist in making this trip possible”. In speaking to Mrs Ralda Jones, Functional Skills Class Teacher, she said “We know that this will be an awesome opportunity for our students. Not only will they be representing their school but their country Bermuda as well. “In the past, our former students have won over one hundred medals and they have felt very proud of themselves, and rightly so. This trip will also allow the students to put into practice some of the many skills they are learning throughout the school year, such as money management, food preparation and daily living skills”. When asked how the children were feeling about the trip, she added “Currently the students are rigorously training for the track meet with training sessions and weight training in the school gym. They are very excited about traveling and participating in the games”. North Village President Stephen Coddington was on hand to present a $500 donation towards the Functional Skills Travel Fund and said “North Village is more than just a football club. We firmly believe that community clubs such as North Village have an important role to play in shaping our youth’s future. “We strive to provide our youth with an outlet to embrace community spirit through sporting endeavors and community service events. We are happy to be able to help CedarBridge Academy in their efforts to provide the Functional Skills Class children with such an experience”. 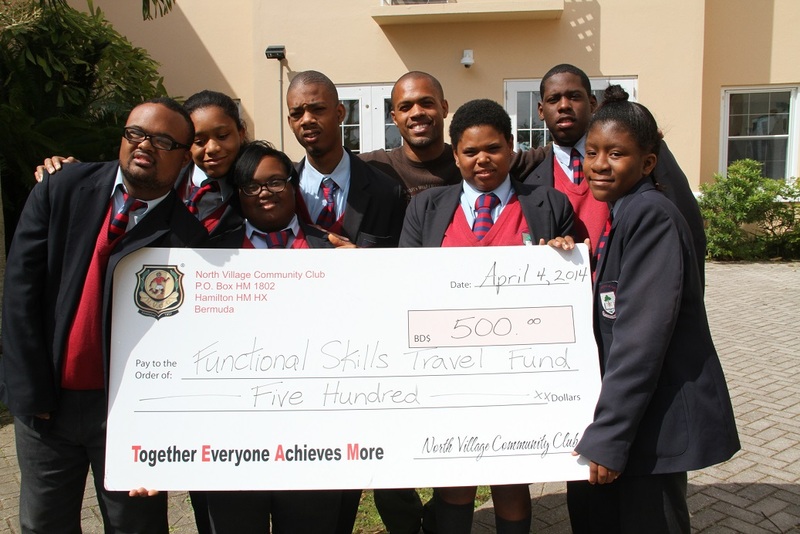 To get more information on how you can contribute to the Functional Skills Travel Fund contact Mrs Ralda Jones at rajones@cedarbridge.doe.bm. Thank you very much North Village for your support from a very thankful grandmother of one of the Athletes. Trusting more companies will support our children. The Cedarbridge Students have been traveling often to Delaware and I trust that other schools will be motivated to send participants as well. These children have great fun and enjoy the competitions. We pay our politicians enough money…this team and the last one!